I always worried if I would let my kids get dirty. I like to be clean. and dry. That’s me. We went on a horseback ride/overnight camping trip while I lived in Australia and it took everything in me to consciously decided (over and over) that I would be okay without a shower for 36 hours. Sleeping on the ground was fine. Relax and ENJOY!!! What does that have to do with anything? Well, remember this picture? 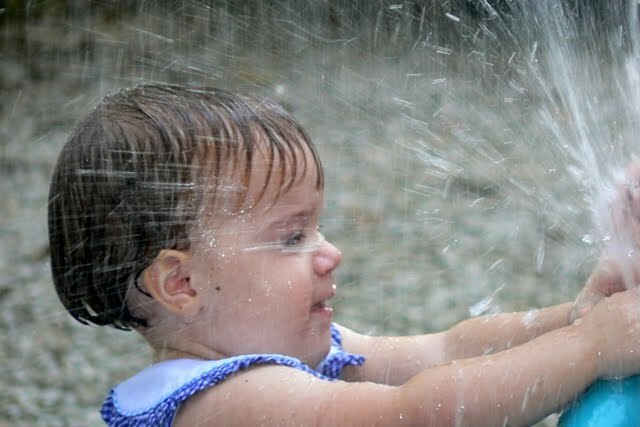 It was taken on a day when Bubba and Little played in the water on their new slide and got wet and filthy and LOVED IT. Today I went out to clean that same slide so I can list it on Craigslist (we haven’t taken it out all summer – someone else can enjoy it, right?). I got the water hose so I could spray the slide, had all three kiddos out with me so they could enjoy the beautiful weather (run, swing, go play), grabbed a few rags and went to work. The three children did not run, swing, or go anywhere. They were right beside me helping to wipe the slide, begging to go down the slide, etc. Finally I decided KB needed her shot at the fun this toy provides. I hooked up the hose, got the pool for a soft landing, made the conscious decision to let them get filthy (they will wash, for pete’s sake) and let the kiddos go. It was SO MUCH FUN! They did get filthy but I stripped ’em down in the basement and everyone jumped in the tub for a continuation of the water party. I was drenched as well and speckled with dirt and grime. Even at such an “old” age I’m “evolving”!!! Looks like fun! 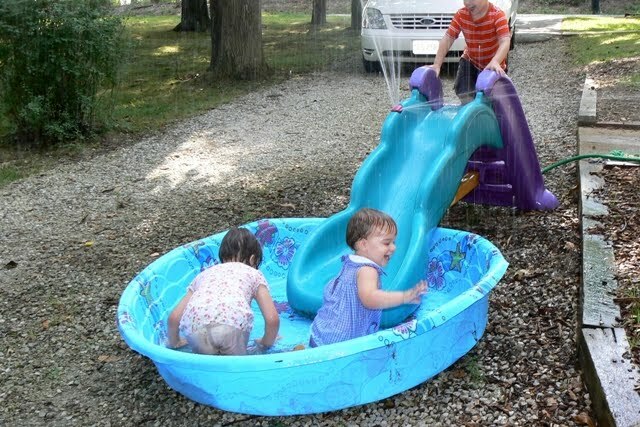 I have a picture from several years ago with the girls soaking wet in their clothes in the pool, too. Good fun!